Watermelon has been used for ages in folk medicine, and now current research shows it can also protect the liver, heal muscles and provide other health benefits. When you juice watermelon or drink store-bought watermelon water such as WTRMLN WTR, you get a concentrated source of its beneficial properties. Elson Haas, M.D., author of "The Detox Diet" notes fresh juices are an excellent delivery system for many vitamins, minerals and other nutrients. When juiced, fruits like watermelon are broken down and compacted to allow increased consumption, thereby providing more nutrients that when eaten in solid form. Vitamins and minerals in watermelon include potassium, B vitamins, vitamin A as beta carotene. Watermelon also contains antioxidants, including lycopene, which may help reduce the risk of some cancers. A study published in September 2011 in "Food and Chemical Toxicology" studied watermelon juice's potential therapeutic effects on the liver. In the lab, administration of watermelon juice lessened liver damage from exposure to carbon tetrachloride. This toxic chemical is found in the air and industrial products, and it is known to damage the kidneys, liver and brain. The study concluded there is evidence to support use of watermelon juice to combat liver damage from carbon tetrachloride. Another study, this one from the August 2013 issue of "Journal of Agricultural and Food Chemistry" showed watermelon may reduce muscle soreness and heart rate recovery in athletes. The study's authors note l-citrulline, an amino acid in watermelon, is effective in reducing muscle soreness, and the study used both watermelon juice and l-citrulline itself. 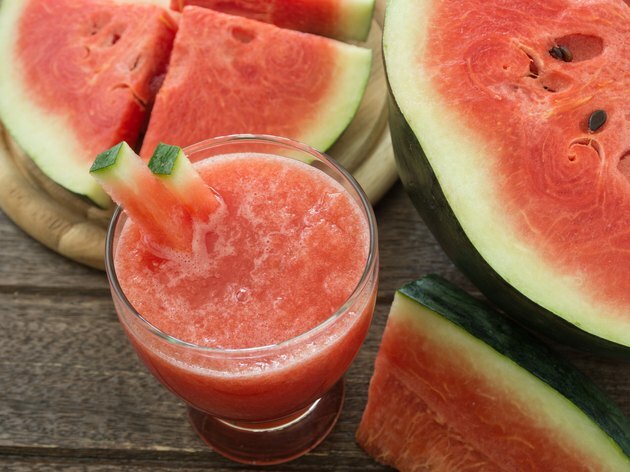 The study found l-citrulline was absorbed better when in watermelon than alone and concluded watermelon juice is effective in reducing muscle soreness and heart rate recovery. In 2013, "The International Journal of Research in Pharmaceutical and Biomedical Sciences" published a study from Delta State University in Nigeria, where researchers acknowledged watermelon's widespread use in traditional medicine. The authors note watermelon contains several beneficial compounds, and folk medicine uses watermelon to treat kidney stones, alcohol poisoning, diabetes, high blood pressure and other conditions. Because of watermelon's popularity in indigenous cultures, these researchers reviewed current research on watermelon and found much substantiation to folk medicine's claims.